My discovery of stair exercise workouts came when I had to walk up 19 flights of stairs to visit a friend of mine. His elevator was out of service. Anyone who has done this knows how tough this can be. After that day, I decided to give stair climbing workouts a try and have been using them ever since. I initially used stair climbing workouts to improve my aerobic conditioning but as time went on I learned to use it for: Anaerobic Conditioning, lower body strength and power development and flexibility. Real stair climbing is the actual use of stairs and stair cases. I do this to differentiate it from modifications like the Stairmaster TM and Step Mill TM. Although equipment like the Stairmaster TM and Step Mill TM can have great value they cannot compare to what Real Stair Climbing TM has to offer. The actual act of walking or running up staircases. From the first floor to the top floor and back down is considered a round of stair climbing. This is not written in stone. Call it what you like. I also sometimes call it a set. Also in my own workouts, I rarely walk downstairs. I usually take the elevator down for safety reasons, but also keep in mind in the high school I work in we have to use the stairs to get back down, but we make it a point not to run downstairs and just walk down and take our time. It is not going to improve our conditioning, but in this case safety takes the precedent over improvement. My favorite use of stair climbing is anaerobic conditioning. As with any workout start off with a warm-up and stretching. I suggest you use one round of walking up the stairs and then proceed to the anaerobic work. In my own workouts I prefer to run up the stairs for anaerobic work but you could also walk very fast. I also prefer to climb every 2 steps but you could use every step. Experimentation will help you decide what works best for you. In my own anaerobic workouts I usually climb 6 to 12 flights at full speed and then rest for 2 to 3 minutes. During my rest period I usually continue to walk up a few flights. I find this allows me to recover faster. Experiment to find what works best for you. I usually perform anywhere from 4 to 10 sets. As your conditioning improves you have many options to challenge you further. You can climb more flights. Round 1: Warm-up - walk up 20 flights at slow pace (4 to 5 minutes). Take elevator or walk down. Round 2: Warm-up - Run up 10 flights (every other step & go half speed), (1 minute). Rest 2 minutes. Round 3: Run up 10 flights (full speed & every other step), (30 to 45 seconds). Rest 2 to 3 minutes. NOTE: In this workout I had access to 20 flights of stairs. To start this may be enough for most people. As one's conditioning improves you can add rounds, add flights or reduce intervals to continue improving or use a weighted vest. Another great anaerobic conditioning tool is an all out sprint to the 20th floor (that's if you have 20 flights of course). By the 18th floor your legs can barely move. You'll be forced to walk but your body will still be in an anaerobic zone. When I'm pressed for time I use this as a workout. Just do 1 or 2 warm-up rounds of 20 flights and then use the third round as the sprint to the 20th floor. Another fun way to do anaerobic training with groups (especially athletes) is to race up flights of stairs. One person uses one stairwell and the other the opposite. An all out race to the top will challenge even the best conditioned athletes. With the high school student/athletes I've worked with we had access to 12 flights and racing up those stairs proved to be one of the best ways to condition them. They didn't see it as a workout but just a race. So just calling it a race really motivated them. Remember to try and pair people of equal ability. There are many ways to do anaerobic conditioning in stair cases. Just remember to be safe and what you're trying to address. Anaerobic work should have you breathless. To get an idea of how you should feel, run a ? mile track at full speed and you'll see what I mean. I think the main reason I like anaerobic conditioning so much is because it gives you more bang for your buck. I find that conditioning is a limiting factor in many athletes. Many complain that they just don't have the strength late in games. I think they have the strength it's just their lack of conditioning doesn't allow them to use it. I find myself outlasting many high school students in basketball games and I think one big reason is my conditioning. The only thing I usually have over the student/athletes is strength. They are usually quicker, more powerful, and more skilled. But my teams usually prevail in games because I don't tire easily. It also helps that I've been playing for over 20 years but I certainly notice the difference of how I feel (great) and how they look late in games (gasping for air and bent over). The first way to improve lower body strength in stair-workouts is to climb every other step (essentially performing a lunge). Because doing this puts your legs in a mechanical disadvantage your muscles have to get stronger to overcome this disadvantage. I also have certain people climb every three steps to challenge them even further. But this is usually left to very tall people or last people with very long legs. Two steps is usually enough to challenge most anyone. For the purpose of strength improvement it's only necessary to do 1 to 5 sets of 1 to 30 repetitions on each leg. You can either alternate or use 1 leg at a time. As your strength improves you can either increase repetitions, resistance (via dumbbells, barbells, weighted vests, sandbags etc? ), or speed to challenge yourself further. Although I've done 20 flights of stair lunges totaling around 60 repetitions each leg it's important to remember the goal of the workout (are you trying to improve strength or strength endurance). Strength protocols usually only call for between 1 & 20 repetitions for a few sets. But feel free to experiment as nothing is written in stone. One day I decided to see how hard it would be to climb every other step to the 20th floor. What a workout that was! Is it really strength training in technical terms? No, but if you're able to do this you will have achieved a high level of strength endurance that many people will never achieve. Another way to do stair lunges is to use diagonal, cross-over and side lunges. The great thing about using these lunges is they address exercising in different planes of motion. Most people exercise in straight line forward or what experts call the sagital plane. Most people have plenty of strength in this plane. It's in the side to side (Frontal plane) and the rotational (Transverse plane) that people are weakest in. It's no coincidence that people get hurt in these planes. Most ankle injuries occur in the frontal plane and many knee injuries occur in the transverse plane. Stair climbing lends itself very well to doing lunges in all planes of motion and can really help someone improve their strength in all planes of motion to balance out their strengths and weaknesses. In my own experience I've gone for weeks with just doing stair-climbing in frontal and transverse planes and my knees have never felt better. Walking down stairs can also be used to improve eccentric and deceleration strength which is very important in everyday life as well as sports. Always remember to use caution when going down stairs (because of the risk of falling). I prefer to just use the first couple of steps and just work down from there. For obvious reasons, one should never run down the stairs (it's too dangerous). Always remember safety first. Round 1: Warm-up - Walk up 20 flights. Stretch when you reach the top. Take elevator down when you've reached the top flight. Round 2: Do 30 stair-lunges - 15 on weaker side followed by 15 on your stronger side. (Climb 2 steps each lunge). Round 3: Do 30 stair-lunges in alternating fashion. (Climb 2 steps each lunge). Round 4: Do 30 crossover-lunges in alternating fashion (climb 2 steps each lunge). Round 5: Do 30 crossover lunges from sid - 15 on weaker side followed by 15 on your stronger side. (Climb 2 steps for each lunge). Round 6: Do 30 side to side lunges in alternating fashion. (Climb 2 steps for each lunge). Round 7: Do 30 side step ups - 15 on weaker side followed by 15 on your stronger side. (Climb 2 steps for each lunge). NOTE: Some people may not have the strength and/or flexibility to climb 2 steps in the fashion described. In this instance, just climb one step each lunge. In this workout you'll be doing lunges in all planes of motion. Remember that it's very important to address frontal (side to side) and transverse (rotational) planes because that's where many people are weakest and is probably why people get hurt in those planes so frequently. We usually don't address these planes in our exercise routines but constantly use these planes in our everyday lives. To improve lower body power plyometrics can be used in stair workouts. To do this you can use single, double, and triple hops with either both or one leg at a time. You can use side hops, side to side hops, transverse hops and so on. You can even use eccentric hops. The key to any plyometric program is to perform the jumps with excellent form quickness and explosiveness. Remember, you are training yourself to exert force as fast as possible and to improve your power output. 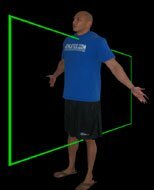 Although plyometrics can and will improve your conditioning, it's primary purpose is to improve your power. I have athletes to walk upstairs and jump rope to warm up. Then they proceed to sets of 1 to 15 jumps depending on the height of the jump and whether one or two legs are used, and also depending on the surface used. Sometimes we use surfaces in stairs that are more forgiving, but sometimes we may use stadium steps which may be concrete and also are less forgiving. It is very important to keep that in mind as safety should always be an issue when doing any workout. 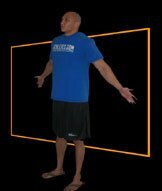 I usually have athletes perform forward, lateral, side to side and rotational jumps. One important point to remember is when training single leg jumps to start off with your weaker leg first. Warm-up - Walk up 20 flights, easy pace, for 3 to 5 minutes. Take elevator or walk down. Another way we warm up for plyo-workouts is jump roping or jumping jacks. Here are some plyometric exercises we use in our Real Stair Climbing workoutsTM. Both legs using 1 step: 5 to 20 repetitions. Rest 1-3 minutes. Both legs using 3 steps: 3 to 10 repetitions. Rest 1-3 minutes. Both legs using 4 steps: 1 to 5 repetitions. Rest 1-3 minutes. Both legs using 5 steps: 1 to 3 repetitions. Rest 1-3 minutes. * This sequence can be repeated 1 to 3 times. Frontal Plane side hops (hops from the side using giant steps). Keep in mind here that I have not seen many athletes hop 5 or 6 steps for reps. Another thing to remember is the danger involved when adding more steps. Always keep safety in mind first and then proceed to design workouts or exercises. Usually, we just go as high as four steps and save the really tough jumps just to see how many we can get in one jump (as a test). Also keep in mind that when I am working high school students, many times it is just better to give them a time frame. In my experience, they hardly ever remember how many reps they do and it is just better to tell them to jump or hop for a specific amount of time. Usually we hop from 10 second all the way up to a minute depending on what we want to accomplish. This will make it makes it easier on you and it makes it easier on the student. Obviously there are a number of ways to change a power development workout. Just remember one thing: it is easy to make this a conditioning workout by adding too many jumps. Concentrate on being able to jump with quickness and efficiency and do not jump to complete fatigue. Use form as a guide. If your form is breaking down, then stop the set. On the other hand, you can use jumps to condition yourself because in sports it is not always who jumps the highest, but who can the jump most moderately throughout a game. Especially late in games. Experiment and find what works best for you and your particular situations. With teams, I usually do power development one day, stressing form and keeping the reps low, and conditioning on a separate day to maximize the goal of each workout. Here are some ideas I have come across over the years to make Real Stair ClimbingTM workouts more intense, more fun, and more interesting. With a jump rope you can increase the intensity of your workout simply by skipping before or after your stair climbs. We have used them before and after climbs as well as in between flights. The use of a jump rope is also an excellent way to warm up. Also, keep in mind, if you have access to only a few flights a jump rope can really help here. One client of mine actually only has access to 2 flights of stairs. So she jumps for 30 seconds climbs 2 flights and then jumps again for 30 seconds and so on. I really don't understand why many athletes don't use a jump rope to warm up. Especially athletes that jump a lot like volleyball and basketball players. I guess because it's so simple many people just dismiss it.. It's too simple and low tech so it must not be good (not true ?). Even though a jump rope is a very simple piece of equipment and very affordable, if you really get into jump roping the work can be brutal. Weights can be used to increase the intensity of the aerobic & anaerobic work, lunges or can be used to do exercises between your climbs. I have used dumbbells to increase resistance in my lunge workouts and I have also done climbs with 40 pound dumbbells in each hand just to try something new. I got the idea from a student whose father is a construction worker. He told his son that climbing stairs with sand-filled buckets is a true test of anyone's strength. He was certainly on to something. A weighted vest can be used to add resistance to your climbs and make them more intensive. I have used weighted vests for almost anything that you can do in stair climbing. I love using them for power workouts to add resistance. Calisthenics can be used between climbs to improve strength and/or conditioning. I have used anything you can think of between climbs. I have done push-ups, squats, handstand push-ups and you name it. What program couldn't benefit from the strategic use of stretching? I usually stretch my chronically tight areas after my first climb to the top and in between climbs while I am waiting for the elevators. I also do a more complete stretch after my workout is done. Curtis Martin of the New York Jets: I'm sure this isn't all he does but if you spoke with him I'm sure he would attest to how effective stair climbing is. I'm sure many more: it's that effective. Everyone I know who has tried stair exercises rave about how effective they are and many who did not like it told me that it was just too dam tough. Why it is not talked about? I really don't know. Maybe because it's not glamorous or high tech people dismiss it. Sometimes we forget to use our environment. As a personal trainer, strength and conditioning coach and a physical education teacher I often hear things like I cannot get to a gym, we don't have enough time or we just do not have the facilities. Sometimes we get caught up in thinking we need the latest high tech whatever to achieve fitness, athletic or any goals related to exercise. In reality we are all blessed with the most high tech equipment available (Our own mind and body). Just take a look around you. A stairwell, a park, monkey bars, and the list go on and on. Forget about what you do not have and focus on what you do have. In my experience it is usually more than enough to get the job done. For an in depth DVD video set on the Ultimate Stair Exercises visit www.givstrength.com. To contact Virgil Aponte visit his web site at www.givstrength.com or email him at virgil@givstrength.com.